Active Candle reacts on candlestick formations in EURUSD and equalizes it with current highs and lows of days, weeks and month before to trigger a trade. No martingale, no grid, no hedging, always just one order with StopLoss. 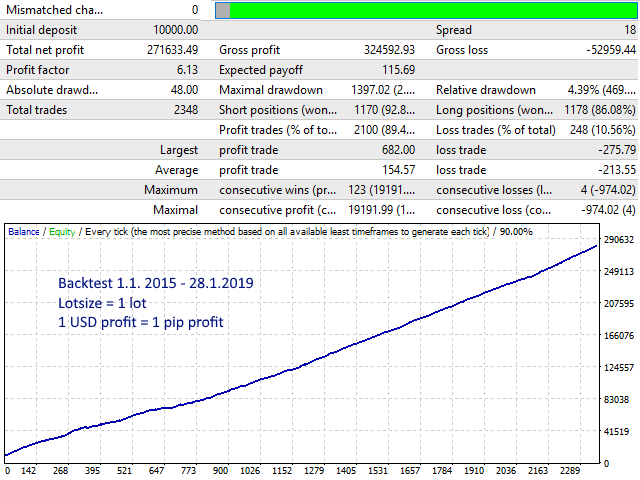 As it isn't scalping there's no need for a super fast connection or ecn account, but the spread should be low. The backtest is made with wide spread to simulate slippage. Active Candle works in M5 charts but the internal strategy relies also on H1, D1, W1 and MN1 charts. Download that data for a correct backtest! Default settings are for EURUSD M5 chart. After 4 weeks of trading the first account was deactivated by Roboforex. SetUTC - timezone setting. The default set UTC=2 is used by many brokers. First impressions quite good. will update to all five stars if this keeps on this way . Fifth star added. I like this one ! Отличный советник. достаточно безопасный и прибыльный. Тестирую уже более 3-х месяцев на реале. Как с агрессивными настройками , так и с консервативными. На данный момент результаты хорошие. Ссылка на реальный счет есть в комментарии #32 к советнику https://www.mql5.com/ru/market/product/35264#!tab=comments&page=2&comment=11247096 .